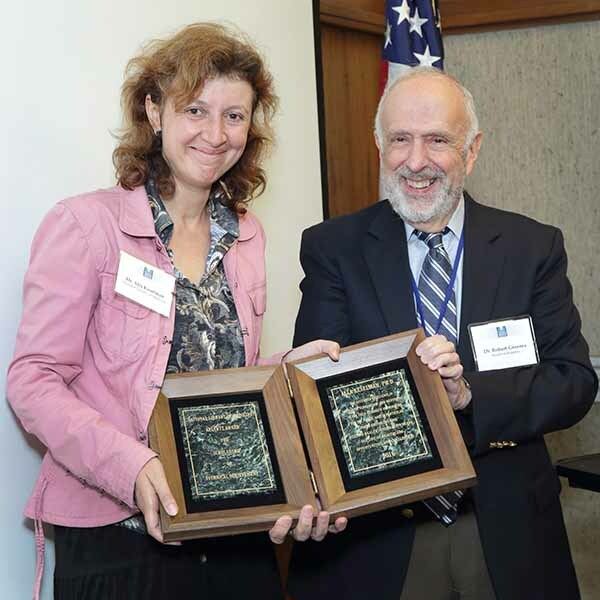 The NLM Regents Award for Scholarship was presented to Alla Keselman, PhD, at the NLM Board of Regents meeting this month. Dr. Keselman, a senior social science analyst in NLM’s Division of Specialized Information Services (SIS), is co-editor of Meeting Health Information Needs Outside of Healthcare: Opportunities and Challenges about the ways consumers seek, find, and process health information. Dr. Robert Greenes, chair of the NLM Board of Regents, presents the Board’s highest honor to Dr. Alla Kesselman. The book’s 14 chapters, by 20 authors, cover health literacy, designing health information programs for vulnerable populations, providing health information within public libraries, delivering health information to older adults, how health news coverage is impacted by journalistic beat assignments, and more. The Regents Award for scholarship or technical achievement was established in 1970 by the Board of Regents, acting as private individuals, and supported by a gift donated anonymously by an NLM employee. The award is designed to recognize and stimulate independent creativity leading to scholarly and/or technical achievements that enrich biomedicine. The Board considers this award the highest honor it can give to a member of the NLM staff.